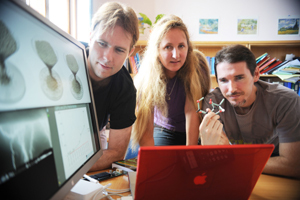 No game: James Gain, Dr Michelle Kuttel and Patrick Marais are part of a group looking to tap the potential of graphic cards for more academic work. If you've heard the internet gossip that the US military was snapping up PlayStation 3s and Xboxes while also keeping an eye on exports of these gaming units to countries with nuclear capabilities, perhaps it's a little more than mere paranoia. The sales-boosting graphics on these and other gaming consoles are driven by powerful graphics processing units, or GPUs, which are found on the machines' graphics cards. In fact, these GPUs are so packed with processing juice that they are increasingly being used as the engines of a new generation of wallet-friendly supercomputers, in a process known as general-purpose computing on graphics processing units (GPGPU). At UCT, Dr Michelle Kuttel, Dr James Gain and Dr Patrick Marais are among those in the Department of Computer Science learning to mine GPUs for their own academic ends. Kuttel's interest in GPGPU was piqued by her work in computational chemistry, which often involves the simulation of molecules and viruses and their workings. Gain and Marais, in turn, lead a computer-graphics group that, among other things, creates visuals to simulate flames, water or - even trickier, apparently - running sand. These are tasks that are best performed on supercomputers, using hundreds or thousands of computer processors. But inevitably, that makes a supercomputer a costly item. In contrast, a graphics card can be picked up for under R10 000, and its GPU can then converted to do the job of 10, 100 or, in some cases, 1 000 processors. But - as is the case when you want to stick a Lamborghini engine into your 15-year-old jalopy - that takes some doing and reprogramming. Reprogramming that can take months, and demands some high-level programming skills. So over the past two years Kuttel and Gain have been working to train programmers in the art and science of converting GPUs into GPGPUs. Master's student Duncan Clough and PhD student Ian Tunbridge were the first Kuttel posted to the University of Illinois in the US for some instruction. And now the group is looking to do some local training as well. "You don't want to keep shipping students over to the US; we want to train our own programmers," says Kuttel. So last year students Jason Brownbridge, Juan-Pierre Longmore and Tunbridge ran a workshop on GPGPU at the annual conference of the nearby-based Centre for High-Performance Computing, which is used by many UCT scientists. In addition, Gain is running a GPGPU course - on which Kuttel, Brownbridge, Longmore and Tunbridge lecture - that will include students from Stellenbosch University and the University of the Western Cape. "People outside of computer science need this resource, so we've got chemists and physicists and astronomers all saying they want to do their hard computing problems on these cards," says Gain. "But they don't have the skills, so we need to train people up." Recruits are many, lured by the new challenge and the stature it'll lend to their CVs. In addition, the UCT GPGPU group has been setting up collaborations with others eager to avail themselves of this new brand of supercomputer. Kuttel, for example, is working with a colleague in Cambridge, while UCT's Department of Astronomy and the School of Architecture, Planning and Geomatics have also approached the group for computing assistance. "There are some problems that don't become solvable until you put them on these chips, because they could take years otherwise," says Kuttel. Now those computations can take a fraction of the time. And as GPGPU supercomputers are still in their infancy, it's likely they'll just get faster and better. And then comes PlayStation 4!